Welcome at Jimbow's: Jimtendo Games, Movies and Images! Here you can find all the games and movies I've created, plus some images I like. Some of those images have also been created by me. Jimtendo's history: Jimtendo used to be my nickname back in fourth grade of High School. 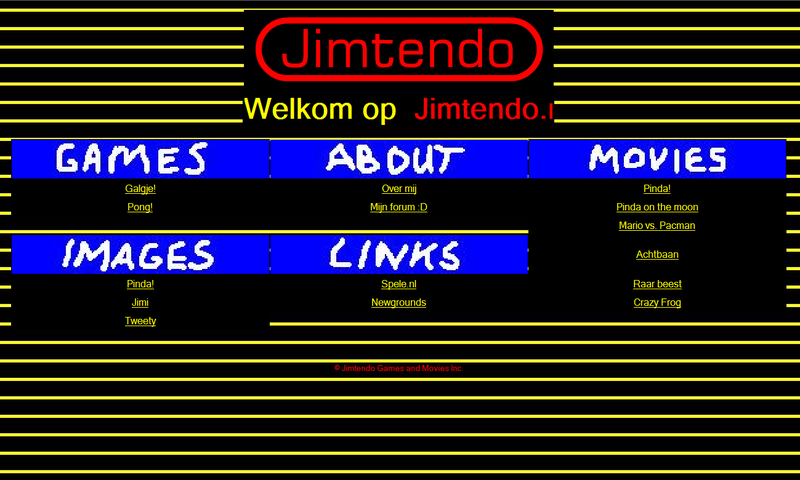 Back then, I created my first website and called it Jimtendo (Live demo, Screen). In general, this version (the third) is still the same as the original. It holds some flash games, videos and images. However, time has brought its changes. In version 2.0, the additional things like links and some information about me were left out and the layout was strongly improved. The next version, version 2.5, was, apart from another layout change, pretty much the same as version 2.0. This was the first version to be called Jimbow's: Jimtendo Games, Movies and Images though. Right now, we're using version 3.0. Again, there has been a change of layout. But that's not all. Every file on the site now is represented by a thumbnail and all categories are postioned on separate pages (there is a page with the newest and most popular of all though). People are now also able to register and add some comment to the files. And, last but not least, I've created some administration tools for myself. These aren't visible for most of you, but it gives me the opportunity to add files without having to start an FTP program. That's the history of Jimtendo so far, but I guess more changes will come in the future. Below you can find the newest and the most popular games, movies and images.